In Wars of Plunder: Conflicts, Profits, and The Politics of Resources, Philippe Le Billon embarks on an ambitious task of reframing the debating surrounding “resource wars.” Not satisfied with the simplistic geopolitical and socio-biological explanations of why conflicts over resources proliferated at the end of the twentieth century, Le Billon reframes the debate by stressing that resources “should not be considered as simply raw materials that come out from nature, but as complex objects produced by socio-natural processes” which are rightly understood as “subjects influencing social relations” (10). Drawing on his years of direct field experience, Le Billon broadens the scope of inquiry by asking whether the presence of resources is the problem or if the problem is the context of resource exploitation (9). This social view of resources sets Le Billon’s book apart from other literature on “resource wars” and is a welcomed addition to the scholarly debate. Grappling with the sad reality that most conflict-related deaths following the Cold War have occurred in primary commodity export dependent economies, Le Billon’s central argument is that “resource sectors influence the likelihood and course of armed conflicts” (4). Le Billon is clear, however, to emphasize that the deterministic view of resources causing conflicts is incorrect, and that ignoring how resources shape and are expressive of social relations is a mistake. Therefore, a proper understanding of “resource wars” needs “thick historical and geographical contextualization” (57) of “resource dependence and the specificities of the resource sectors involved” (5). Le Billon centers his argument around three dimensions: vulnerability, risk, and opportunity. The first dimension describes the “resource curse” argument, where economic dependence on a resource results in “economic underperformance and a weakening of governing institutions” thus making a country more vulnerable to conflict (13). The second dimension depicts the “resource conflict” argument, where some resource sectors are more prone to violence and conflicts because of their direct linkages to the “control and exploitation of resources” (13). The third dimension illustrates the “conflict resources” argument, which “focuses on the financial opportunities that sustain armed conflicts” (13), particularly how belligerents take advantage of resources to “finance their struggle” (73). When viewed together, these dimensions explain how resource endowments play a role in “shaping greater vulnerability to, risk of, and opportunities for armed conflicts” (14). With numerous possible resources to analyze, Le Billon concentrates on three: oil, diamonds, and timber because these resources account for most resource related violence post Cold War. These resources also share an important characteristic: while produced by nature, they must be extracted from nature to be useful. Extraction is inherently a social endeavor requiring complex relationships between multiple parties throughout the commodity chain. The study of “resource wars” cannot be isolated to belligerents but must include the companies that purchase the resources, end consumers who demand the resources, and governments who are indirectly complicit with resource conflicts through indifference or a refusal to engage because they succumb to pressure from interest groups who have vested interests in resources. Expanding the number of parties analyzed allows Le Billon to broaden the definition of violence considered. Whereas previous studies of conflict and resources “rest on narrow definitions of violence” (122), Le Billon considers structural, symbolic, and physical forms of violence for a richer analysis. For example, when discussing oil, Le Billon does not assign blame for violence solely to rebel groups. Instead, he faults governments and consumers for not reducing their oil demand, which “reinforces scarcity and an associated politics of tension around ‘strategic’ oil areas”, leading to “the geopolitics of fear and force” (83). In regards to diamonds, a narrow definition of violence would exclude De Beers from any blame even though they profited from conflict diamonds and resisted attempts to curtail the trade (85). A narrow definition of violence would also excuse foreign owners of timber companies from any wrongdoing, despite their role in influencing colonial policies and institutions that are still distortive today (130-131). Uneven development, environmental degradation, invasive regulatory interventions, armed conflict, etc. are all forms of violence that must be considered by policymakers looking to manage extractive resource sectors. The three resources (oil, diamonds, and timber) Le Billon highlights provide varying degrees of evidence relating to the three dimensions of conflict (vulnerability, risk, and opportunity). The author finds strong evidence between oil and conflict (82). Oil booms and busts lead to institutional weakening, increasing vulnerability to conflict. The concentration of oil deposits and the need for capital intensive extraction techniques that limit local employment opportunities encourage armed conflicts aimed at controlling oil flows (71), increasing the risk of conflict. Onshore oil locations allow belligerents to extort oil companies for “protection” or kidnap oil staff for ransom payments, increasing opportunity to conflict. For diamonds and timber, the opportunity dimension is the strongest link to conflict. Secondary deposits of diamonds are “easily mined and highly valuable” as well as “easy to conceal, transport, store, and trade” (109), all attractive qualities for those looking to finance conflict. Insurgents and guerrillas can “opportunistically use” dense forests “as advantageous terrain” and “as a source of finance” (150). The last section of the book evaluates “conflict termination strategies” and “conflict prevention and peace-building more broadly” (151). Three conflict termination strategies are considered: military intervention, economic sanctions, and using resource revenues to “buy” peace with belligerents. Each of these interventions has varying degrees of success in preventing conflict. Military intervention can be successful in targeting belligerents but can also “fuel nationalist mobilization, thereby escalating the conflict” (184) and fail to “usher in a stable peace” (185). Well targeted sanctions can deprive belligerents of revenue, reducing their ability to wage conflict, but are notoriously difficult to enforce and can invite corruption (i.e. the UN Oil-for-Food Program for Iraq). Using resource revenue to attain peace is “possible insofar as resources constitute divisible goods, especially in terms of revenue and to a lesser degree in terms of ownership” (171), but is controversial because it “may be perceived as rewarding violence” (174). Le Billon cautions against generalizing conflicts and applying cookie cutter solutions since the effectiveness of intervention are influenced by “the type of resources and type of conflicts involved” (179). Le Billon presents three sets of proposals for conflict prevention and peace-building. The first set focuses on resource exploitation management, such as renegotiating “odious” contracts signed by former governments. The second set highlights resource revenue management, such as recovering previously “looted” resource revenue. The final set describes international initiatives dedicated to resource governance, such as international standards for extractive industries. Le Billon acknowledges building peace in areas with a history of resource conflict is “promising because much of the context for resource exploitation can be improved, but also challenging because of the incentives and limits of existing institutions” (221). With these challenges in mind, Le Billon stresses the important role international agencies play in “reforming extractive resource sectors” (222) and that the proposals he advances “are not equally applicable for all cases of post-conflict extractive resource management” (223). Therefore, “the sectors involved, the capacity of institutions, and broader political and economic aspects of post-conflict recover play a major part in deciding which options are most appropriate to pursue” (223). Throughout the book, Le Billon does an admirable job of summarizing the voluminous, complex, and sometimes contradictory body of “resource war” literature. The analysis is well sourced and the examples referenced are numerous, but not too numerous as to distract the reader with needless anecdotes. Along with his careful insistence not to oversimplify conflicts surrounding resources to greed or geography, Le Billon is intellectually honest enough to not try to fool his audience into believing that resource conflicts can be solved with easy steps. Even though there are similarities between resource conflicts, each conflict is unique and the solutions to these conflicts should reflect the conflict’s uniqueness. In addition, the author’s broader definition of violence should become the new standard through which studies on “resource wars” should be analyzed. Resource extraction is not a solitary endeavor and linking the differing roles each party along the commodity chain has in the process is an important inclusion, particularly if the goal of activists and researchers is to find ways to reduce resource violence. Despite Le Billon’s impressive contribution, two weaknesses permeate the manuscript. The most glaring is how the author treats the relationship between institutions and resources. While the author convincingly defends the resource curse hypothesis, where resource wealth weakens institutions, thus leading to poor economic and social outcomes, he does not consider the alternative explanation that poor outcomes exist because of weak institutions already established before resource discovery. This is particularly glaring because the author spends much of the book reminding readers that history matters, and yet never grapples with the possibility that weak institutions are the cause, not the effect, of the resource curse. Le Billon treats resource discovery as exogenous, when it is possible that resource discovery is endogenous to established institutions. While the author could disagree with this line of thought, his omission of this point is a major red flag since he builds his vulnerability argument around it. The second weakness, related to the first, is the assumption that the players involved, not the institutions, are the reason conflict exists. This is particularly clear when Le Billon discusses ways to reduce conflict and promote peace. The solutions rely on “decent” people applying the “appropriate” policies. On this point, Le Billon would have been wise to borrow from public choice theory which stresses that poor outcomes can still exist if the rules of the game are providing the wrong incentives, even if the actors have good motivations. This may help explain why the author is so eager to embrace “prudent” regulations rather than the market forces of supply and demand anchored by solid institutions. 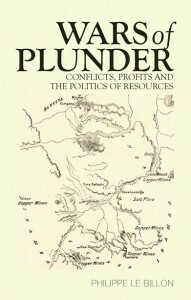 Wars of Plunder is a well sourced and informative read that stretches the reader to consider more complex reasons for why conflict is so prevalent in resource abundant areas. This book would be a welcome addition to the library of a scholar interested in the links between conflict and resources. However, if the reader is looking for a study on how institutions play a factor in the development of poorer countries, this book is not recommended. Jared A. Pincin is an Assistant Professor of Economics at The King’s College in New York City, where he teaches Economic Development.